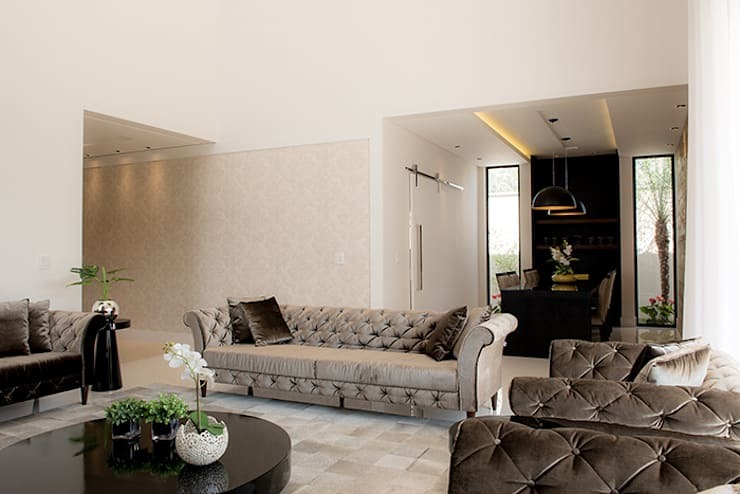 Designed by Camila Castilho Architects, this is a home packed with stylish taste, clean modern lines and a touch of glamour and colour throughout! It's also the ideal family home, which means that it would fit perfectly into any South African neighbourhood or community. A house like this would be the envy of the block, however! It's also secure and safe, without compromising on architectural beauty or aesthetic appeal. If you're looking for inspiration for a happy, stylish and comfortable house, this is the place to look. We will take you on a proper tour inside and out, giving you tips on how to achieve the same look and feel in your very own home! 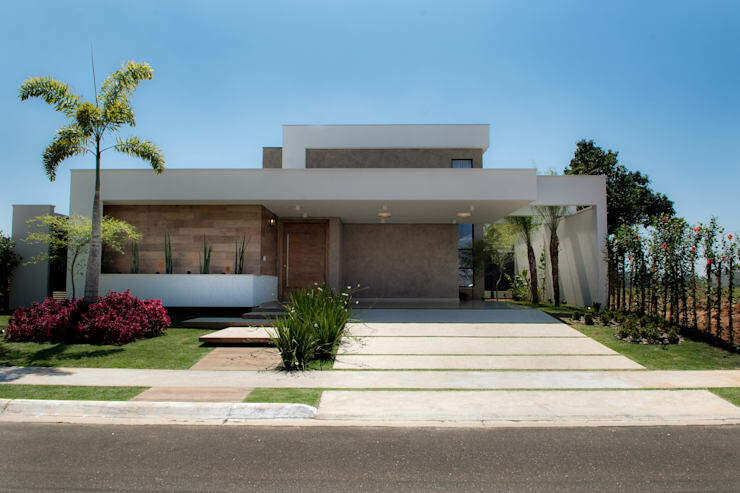 When it comes to Casa Terrea, it's clear to see that the architects are incredibly passionate about their work. They've used very natural and earthy tones for the exterior—wood and cream—to create a subtle and modern effect. The wood is framed by the cream slabs, which create beautiful rectangle and square shapes throughout, which is perfect for volume and texture. The cement driveway is also practical and attractive, allowing for a few cars to park near the house without damaging the grass or the natural surrounds. If you're looking to incorporate a driveway into your home, make sure you opt for bricks or cement—a material that will last a long time and will cope with heavy cars, bicycles and skateboards moving up and down it. These warm, earthy tones works beautifully with the lush green grass and gorgeous plants and flowers that surrounds the home. Tip: Make sure your exterior garden and verge always looks neat and pretty. Prune the bushes, mow the lawn or hire a landscaper to get this right! The sophistication and class throughout the interior of the house is bound to put a smile on anyone's face! This is the type of living room that you want for our family home, where comfort and trend collide! The designers have gone for silver/grey sofas, a light grey rug and dark, furniture. This is something that you can get away with if you have a very light living space, with lots of windows and doors. You don't want to try this if your living space is dark—it will end up looking like a cave. Achieve a light space by installing skylights, large glass windows and doors. Then you can furnish the space with dark furniture to create this elegant look and feel. The dining room is a wonderful example of modern style, where two gorgeous lights hang over the dining room table. This provides a wonderful atmosphere and ambiance during dinner parties. You'll notice that the designers have added a touch of nature here as well, in the form of flowers and little plants. This is a great tip for any room in the house. Opt for natural decor—a big vase of flowers or a beautiful pot plant. The kitchen is one of the best rooms in the house, where the architects have continued the theme of of black, white and neutral colours. However, they've added a lemony twist! A yellow coffee machine, two yellow chairs and a jar of lemons add a subtle but significant dash of colour to this room, working wonderfully with the black. This is the epitome of a modern, retro kitchen. The rest of the room is sleek and simple, with little clutter or objects. This is a fantastic minimalist look, which is great for any small space. It's also easy to achieve. Simply invest in some fantastic cupboard space, where you can store all of your personal items. 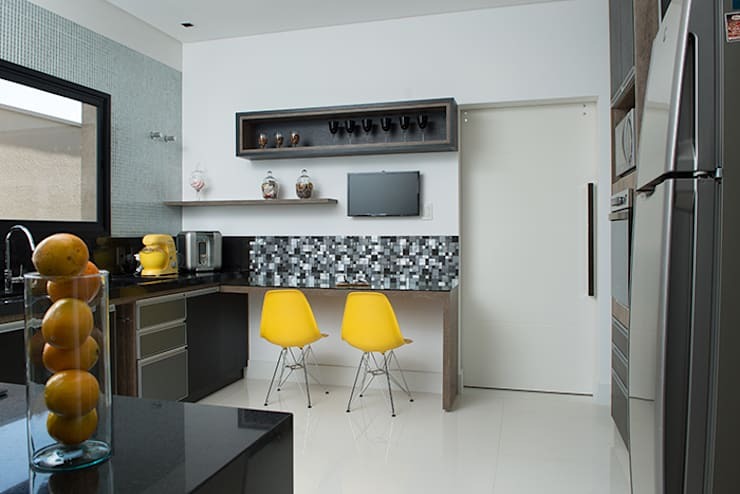 Keep the bare essentials and decorative pieces (like the yellow coffee maker) on the kitchen counters and there you have it: a sleek, simple and minimalist look. You can achieve this same atmosphere in other rooms in the house by opting for neutral furniture and then adding a splash of colour in the form of a painting or some cushions. Chairs and appliances, however, are a great way to achieve this look in the kitchen. Have a look through this range of homify products for the kitchen for inspiration. Finally, we explore the patio that spills out from the interior of the house offering the inhabitants a wonderful exterior space where they can relax, read their books, socialise or sunbathe. Again, the designers have opted for warm, earthy tones that are very neutral and blend beautifully into the surrounds. The idea here is to go for a classy and understated look—which they've achieved fantastically. The important thing to remember when it comes to your patio, is to opt for furniture that is durable and sturdy. There is no cover on this patio, which means that the furniture and decor accessories are exposed to wind, rain, sunshine and maybe even hail. Be sure to invest in good quality outdoor furniture that will last a good few years! You should also read these tips on easy ways to make your patio bigger. This is the type of family home that would merge perfectly into any neighbourhood. Can't you picture living in it too?